UK superyacht builder Pendennis has signed a new-build order for a Dubois-designed 31.3m aluminium sloop sailing yacht. This project marks the 10th collaboration between Pendennis and Dubois Naval Architects, which began with the launch of Taramber in 1991, followed by Beagle Star II, Mamamouchi, Nadia, Beagle V, Margaret Ann, Nostromo, and Ilona, the first motor yacht to be launched Pendennis in 1999. The design features a fixed-bulb keel, submarine anchors and a carbon rudder blade. She will boast a strong and lightweight carbon-fibre rig with fixed genoa and balde stays and removable staysail. Inside, the large master suite is set to the stern below the cockpit while two twin-berth guest cabins (each convertible to doubles) are set forward. the raised saloon enjoys expansive views, while a second lower-saloon seating area offers more privacy and is set opposite of an office area and nav station. 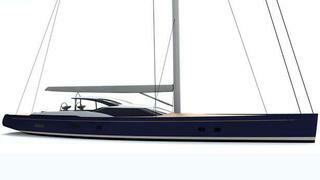 According to Pendennis, the yacht will be built in a staged build programme with the delivery date to be confirmed. Pendennis promises more details to come soon.